That’s how many turkeys have been slaughtered, processed, frozen, and shipped to grocers across the country for Americans to buy and prepare for their Thanksgiving celebrations. I know you’re already aware of the bird’s path from egg to frozen ball in your refrigerator, so I won’t waste your time going there. If you don’t know and are curious, Google will gladly enlighten you. In the past, Native American cultures hunted and ate animals, but prior to hunting they asked permission of the animal’s spirit, and they saw animals as having rights equal to humans. Now people use frozen turkeys as bowling balls, without thought of the sacrifice of the animal or of the people who would benefit from the nourishment those birds could have provided them. 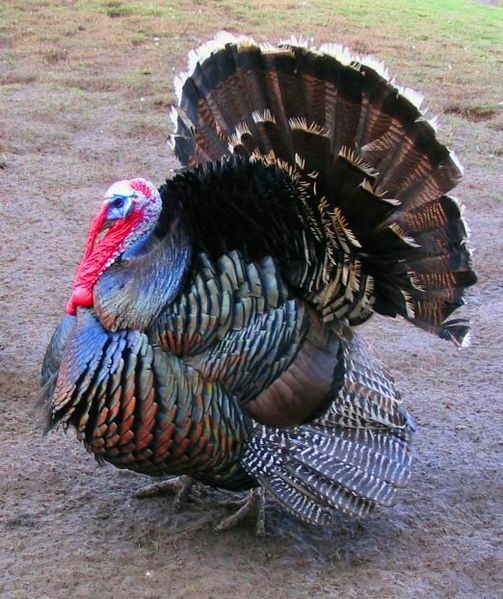 The 45 million turkeys who will fuel our celebrations were each sentient beings, capable of feeling emotions. They had distinct personalities. They experienced empathy. Those birds gave up their lives so that we may share this day with family and friends. Do they not at least deserve a few moments of your attention in return? What of the cows who provided the milk to make the cream, butter, and egg nog? Or the hens who lay the eggs used to make the salads, cakes, and dressing? Should we give thought to the pigs who provide the bacon and ham used as seasoning in many dishes? I ask that we do just that. Let us peruse our menus and consider how many animals are a part of this one meal. And then, while recounting all of the things for which we are grateful, let us also give thanks for the animals making the meal possible. « June Buggie Rants About…… Dental Floss? Even as one who, ‘doesn’t eat it if it has a face’ I enjoyed this read. Good stuff. I say grace before I eat supper. I guess in a way that’s honoring the spirits of the animals I consume. I don’t eat a lot of meat though. After I got married, my wife introduced me to a more organic and vegetarian diet. I am totally conflicted about eating meat because I know the suffering that animals incur to nourish me, but at the same time, I crave meat like an addict. Thanks for your thoughtful post. As many of our community here have said before, people are going to eat meat. But I would ask that especially on this day of Thanksgiving, they give thanks for all of those animals who have nourished our bodies. I think a lot more needs to be done to remember that we owe the animals a lot, laying down their lives so we can eat! That’s why I am so upset to read about the cruel ways they are treated in abattoirs before being slaughtered, disagree with the hours cattle spend being driven up and down our roads before being killed. We owe them more!! Hi Rumpster, great post as always today. It’s funny, because a lot of us (including myself) dont really think about that stuff to often! Whee don’t have Thanksgiving over here but Mummy says she tries to remember all the animals that helped create her meals. The least you can do is honor them. Great post Rumpy! Very important to take a moment and thank those animals who sacrificed themselves for humans. Some still see wild turkeys in the fields and woods. A great tradition could be – if you buy it/hunt it/cook it, for goodness sakes eat the whole darn thing and don’t throw good food away. Invite people over or contact food banks for names of those who need food. Respect shown by the Native Americans should be praised and learned. Waste not want not. We’ve gone so far from the trail. To paraphrase the great Temple Grandin, the issue is not whether we eat animals or not, but what kind of life we give them whilst they are alive. Dude… I’m a kat and I love meat! But now you’ve got me thinking…. I wouldn’t want anyone to make ME a part of their menu! Great post! I only eat meat and I like it raw! I will remember to give thanks! Doesn’t everyone know that the best part of Thanksgiving is the cranberry sauce and stuffing? Unfortunately, commercial wheat growing also has an animal cost. I guess the best we can do is be mindful about our choices. You’re right, Rumpy–no matter what we eat, we should absolutely do it with all of appropriate thought and gratitude. The very heart of Thanksgiving, and that should be applied every day, every time we eat. Happy Thanksgiving! Our holiday meal is going to be vegetarian this year. Vegetarian, not vegan, so we will still have milk and eggs. No butter, though. And the eggs will be organic, raised cage free. Thoughtful post, I will indeed be thankful for the cows for the milk and butter to make mashed potatoes creamy. And for the turkey will be providing lunch for a while. Preach, Rumpy! While we’re at it, stop calling it Happy Turkey Day!